Today the greatest baseball player to ever grace the diamond at Baltimore’s Memorial Stadium, Frank Robinson passed away. On April 4, 2016, I wrote this piece on how Frank Robinson’s arrival in the winter of 1965 changed the course of Baltimore City’s passion for baseball by the black community. I reflect back almost 3 years, as well as reflecting back 53 years to the Spring of 1966. The 1966 season was perhaps the greatest season of major league baseball in the history of our city. It was the season that culminated in the Baltimore Orioles winning baseball’s illustrious World Season Championship with the sweeping of the dominant Los Angeles Dodgers baseball team that included greats like Sandy Koufax, Don Drysdale, Maury Wills , Willie and Tommy Davis. I honor the memory of Frank Robinson, the individual the energized the black community to begin its love affair with the then Baltimore Orioles. The 2016 Baltimore Orioles season is upon us and for me this is the 56th baseball season I can legitimately remember. I really started following the O’s the same year I started first grade at Fort Worthington Elementary School in East Baltimore. I do remember that our principal at the time Harold Galperin being an Orioles fan. Heck wasn’t everyone a baseball fan in 1960, the year the Baby Birds burst on the scene and almost faced downed those big bad Yankees? Hell, I was a black kid who loved baseball, baseball cards, popcorn, peanuts, hot dogs and the Baltimore Orioles. The year 1966 was significant because somehow Harry Dalton managed to steal Frank Robinson from the Cincinnati Reds for Milt Pappas. As a 12-year-old kid before inter-league play in major league or any sports channel like ESPN, the only way I knew of Frank Robinson was from the weekly Baseball of the Week show which aired on NBC, reading The Sporting News at Enoch Pratt Public Library Branch on Erdman Avenue, and of course the annual Major Baseball All-Star Games. I also regularly read Sam Lacy’s featured columns from the Baltimore Afro American Tuesday and Friday. Mr. Lacy was an avid writer extolling the virtues of the black ballplayers in the National League. Before the Frank Robinson trade, the Baltimore Colts were the team for the black community. They were not only a winning organization but the team had black stars who lived amongst the black community (since they couldn’t at the time live in any other neighborhood). Lenny Moore, Jim Parker, Lenny Lyles, and all the great black football players were there in our neighborhoods, so for black kids growing up during my period of time Baltimore was very much a Baltimore Colt football city. In addition, the Baltimore Bullets with Dancing Harry leading the charge captivate the black community with stars such as Gus “Honeycomb” Johnson, who arrived in our city in 1963 and big, bad Walt Bellamy. The Bullets weren’t big winners but Gus Johnson was electrifying both and and off the court. Before Frank Robinson came to town in 1966 the Orioles had two, count them two, black ball players. They were outfielders Paul Blair, who was just getting started on a long major league career, and Sam Bowen, who had a great 1964 but who crashed back to earth in 1965. The Baltimore City community was clearly ready to take the step forward and Frank Robinson answered the call. When Robinson moved into Baltimore it changed how the Orioles were viewed. That single trade moved the dial on baseball in the black community. We loved that the Orioles wanted to win and got a black superstar to ensure that winning was going to be achieved. And the move was was trumpeted by the late great Sam Lacy as the single event that would make the Orioles relevant in the black community. The fact that Henry Giles from the Reds put fuel to Frank Robinson’s competitive fire by stating he was an old 30-year-old player ensured that our Baltimore Orioles got the very best Frank Robinson anyone could ever imagine. Baltimore baseball would never be the same. Frank instilled in all those players around him a competitive spirit that carried on the baseball diamond every day, win or lose. 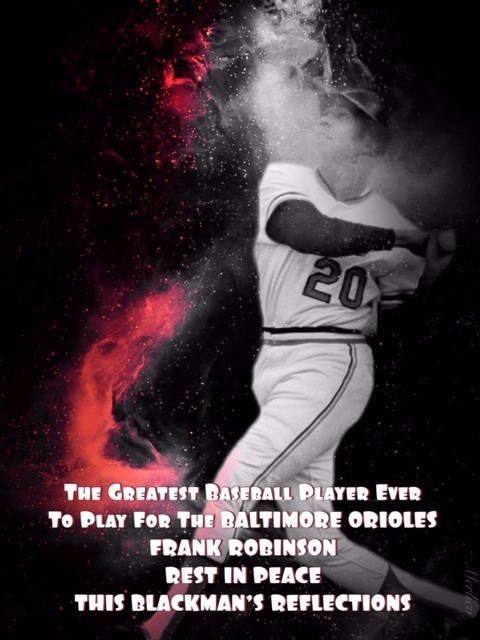 He made each of the players on that team better: Brooks Robinson, Boog Powell, Dave Johnson, Paul Blair, Dave McNally, Jim Palmer, Wally Bunker, Luis Aparicio, Steve Barber, Curt Blefary and the other members learned how to win by playing hard, going hard, and sacrificing themselves for the team. Everyone wanted to be #20 and no one wanted to disappoint #20. Had not Frank come into Baltimore in the winter of 1965 it’s unlikely that the Orioles would have won the World Series in 1966. They had great young pitching and a dynamic infield defense, but Frank Robinson not only glued the clubhouse together, he also captured the enthusiasm that was not being developed prior to his arrival in black communities throughout the city. Harry Dalton made his mark with the trade and built a winner whose interest now exceeded and expanded beyond the white communities of a blue-collar city. By 1969 the Orioles had even more black players on the roster. Robinson, Blair, Don Buford, Dave May and Curt Motton all patrolled the outfield. They played alongside beloved catcher Elrod Hendricks and super utility player Chico Salmon from Panama. Two Cuban pitchers, Mike Cuellar and Marcelino Lopez, added more color to the team. I truly believe that Frank Robinson turned the black communities eyes towards 33rd Street and the Baltimore Orioles where before those same eyes weren’t focused in that direction prior to his arrival. And the changing team dynamic reflected the city as well, as the riots of 1968 had resulted in many whites fleeing the city for the suburbs surrounding Baltimore. What a wonderful time to be growing up in Baltimore. We had the Colts and the Orioles, and for short time the Bullets and three teams were winning franchises. The beauty of that was that 40 miles down the road the city of Washington DC had lovable losers Redskins and Senators. Who had better than us? Nobody was the answer.